Thanahita distos gen. et sp. nov., virtual reconstructions (a,e–p) and specimen in the rock (b–d), OUMNH C.29699. (a,e,f,h,j,m) Whole specimen; dorsal, right lateral, frontal, ventral, anterior oblique, anterior ventral stereo pairs. (b) The specimen on the surface of the split nodule, before grinding. (c,d) The specimen shown on two individual ground surfaces between appendage 2 and 3 (slice 665) and at appendage 2 (slice 705), respectively, which are 0.8 mm apart. (g,i,k) Anterior part of specimen with external surface rendered transparent to show preserved internal structures; dorsal, right lateral, anterior oblique stereo pairs. (l) Posterior part of specimen, postero-lateral oblique stereo-pair. (n,o), Double (n) and single (o) claws on left fifth and left sixth appendages, respectively; sublateral views. (p) Anterior part of specimen; anterior oblique stereo-pair. Scale bars are all 1 mm. app 1–app 9, appendages 1–9; cl, claw; cls, claws; is, internal structures; nr, neck region; pr, post-appendicular region; te, tabular extension of internal structures towards tufted papilla; tp, tufted papilla; tr, trunk; up, unpaired papilla; ve, ventral extension of internal structures towards appendage. Yale paleontologist Derek Briggs was part of a research team that identified Thanahita distos, a new species of lobopodian, an ancient relative of modern-day onychophorans, or velvet worms. Thanahita distos was discovered and reconstructed as a virtual fossil using physical-optical tomography. It came from 430 million-year-old Silurian rocks in Herefordshire, England and it is the first marine lobopodian to be formally described from the Silurian. Its closest relative is the iconic Cambrian lobopod Hallucigenia. The findings were published August 8 in the Royal Society journal Open Science. The first author is Derek Siveter of the University of Oxford, and additional authors are from the University of Leicester, Imperial College London, and the University of Manchester. The Herefordshire (Silurian) Lagerstätte (approx. 430 Myr BP) has yielded, among many exceptionally preserved invertebrates, a wide range of new genera belonging to crown-group Panarthropoda. Here, we increase this panarthropod diversity with the lobopodian Thanahita distos, a new total-group panarthropod genus and species. This new lobopodian preserves at least nine paired, long, slender appendages, the anterior two in the head region and the posterior seven representing trunk lobopods. The body ends in a short post-appendicular extension. Some of the trunk lobopods bear two claws, others a single claw. The body is covered by paired, tuft-like papillae. Thanahita distos joins only seven other known three-dimensionally preserved lobopodian or onychophoran (velvet worm) fossil specimens and is the first lobopodian to be formally described from the Silurian. 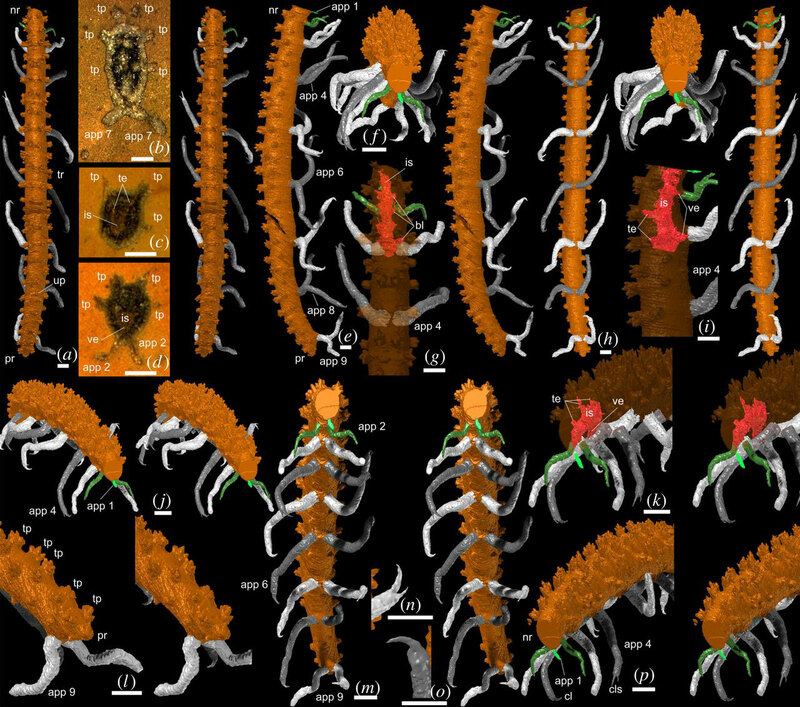 Phylogenetic analysis recovered it, together with all described Hallucigenia species, in a sister-clade to crown-group panarthropods. Its placement in a redefined Hallucigeniidae, an iconic Cambrian clade, indicates the survival of this clade to Silurian times. Be the first to comment on "Paleontologists Discover a New Species of Lobopodian"